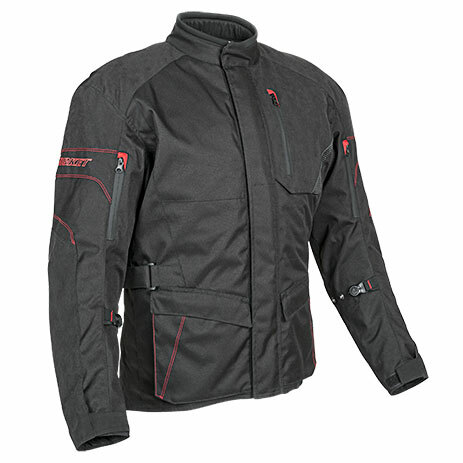 The Ballistic 13.0 textile motorcycle jacket from Joe Rocket Canada® features a 100% waterproof Rock Tex™ 600 outer shell with removable liner and comes equipped with removable Vault™ C.E. approved shoulder, elbow and spine protectors. The jacket boasts Sure Fit™ waist and sleeve adjusters for an adjustable fit, shoulder expansion gussets for minimal movement restriction and sleeve vents allowing for proper airflow. 4 snap loops are included for pant attachment so that the jacket doesn’t ride up and reflective trim for better night time visibility.